A £23m justice centre in the Highland capital of Inverness has been given the all-clear by planners, handing Reiach & Hall Architects and the Scottish Courts and Tribunals Service the green light to progress the build in the spring. 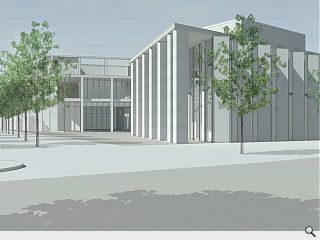 Situated on Longman Road the V-shaped Inverness Justice Centre will offer purpose built accommodation for the service, enabling it to vacate its current home in Inverness Castle which will subsequently be turned into a tourist attraction. Landscaping work will be carried out by Horner + Maclennan. Finally a bit of progress in the Highlands. Inverness gets it’s castle to be a visitor attraction – as it should be – and the court gets moved to a more convenient location away from the centre of the city. Now the old Longman Campus just needs ripped down, it is unfortunate that this new court will be situated next to such a brutal building.